Let's face it, Lebanon's roads wouldn't be the same without them! Anyone who lives in Lebanon, or grew up in Lebanon, or has visited Lebanon knows that public transport makes for a huge portion of our daily commute. More so than others, taxi cabs have been our commuting method of choice for getting around since the early 50s. So whether you call them taxis, serveece, or simply ammo, Lebanese cab drivers are a staple of our daily lives we can't live without. 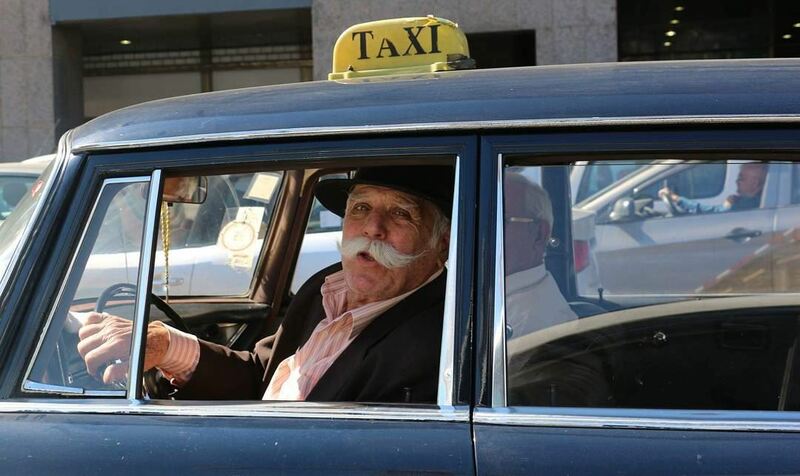 One of the most common types of cab drivers you'll come across in Lebanon are the overly talkative ones. Spending a minimum of 9 hours behind the wheel, it is no wonder the drivers get more than a little bored and seek some friendly conversation. This manifests by endless inquiries into your parents, your hometown, your work, and what you're studying. Foreigners should know that this is a completely harmless behavior. Lebanon is such a small country, in fact, that the questionnaire often leads to discovering common acquaintances and long-lost friendships. This driver is always in a hurry to get somewhere. Where to? No one knows. With one hand on the steering wheel while yours on your heart, this skillful driver navigates tight curves and blind spots at extraordinary speeds. This eager driver will cut through lanes and will jam entire roads to get to you. From angry honking to vehement cursing, nothing -we're serious: nothing!- gets between this driver and his potential passenger. A polar opposite to speedy driver and the 'early bird', the laid-back driver takes 'calm' to a whole new level. Even our infamous traffic jams and driving trespasses can't faze this Zen master. Some of our taxi drivers will drive extraordinary lengths to get to you. For whatever reason, they don't hear you from the first time, and they go on resorting to U-turning and drive-crawling at the edge of the curbs just to hear you scream-shouting your destination. Sometimes, you just have to admire their persistence. This one is pretty self-explanatory. A waft of smoke hits you like a brick-wall as soon as you enter the cab. Regular commuters learn to recognize the signs-- tobacco-stained teeth or a hazy interior -- and avert the driver altogether. Luckily, this local breed is heading towards extinction. An ardent appreciator of the arts, this musical aficionado will blast the speakers of his tiny car, forcing you to endure a long ride of Naim el Sheikh or whatever trending pop favorite. And when the music finally dies down, the 'ear slayer' will take the momentary quietness as an invitation to explain, in detail, their artists' musical ups and downs. This dying driver-breed either has no concept of 'personal space' or chooses not to. The 'let's-take-one-more' driver will cram in passenger after passenger, defying the laws of physics and exceeding both his tiny car's limit and your patience. If you're lucky, you'll hitch a ride with this coveted cab driver. The Roadmaster is an expert navigator of Lebanon's treacherous roads. Even with our infamous traffic jams and pop-up roadblocks, this driver will pull random turns and find hidden shortcuts to get you to your destination. In any case, you can bet he will get you where you need to go with plenty of time to spare. Whatever you do and wherever you need to go, you can trust in the personalized expertise of Lebanon's red-license plate holders: our cab drivers!